Welcome and thanks for stopping by! Hope you'll check out this site to find out more about "﻿The Valentine's Day Curse﻿--A short story" and "Fractured Facade." Both titles are available exclusively on Amazon and Kindle Unlimited members can read for free! Click here for a direct link to "Fractured Facade" and for "The Valentine's Day Curse" on ﻿Amazon﻿, click here! If you'd like, stop by my Facebook page, follow @MsElenaeous on Twitter. Sometimes I'm blogging at MsElenaeous Rants. Check out my Smashwords Interview. Drop me a line at Light540@gmail.com. I love to hear from readers! If you'd like a free Authorgraph on my books click here. "The Valentine's Day Curse -- A short story"
When Lisa’s Valentine’s Day ritual is interrupted by a phone call, she is surprised it’s from someone she hadn’t heard from in many years. What could her ex, Joey, possibly want from her on what could have been their 25th wedding anniversary? The Valentine’s Day Curse is a short story about stirred memories of unrequited love. For some, Valentine's Day is not always a bed of roses. The Valentine's Day Curse...a tale with a twist suitable for any day of the year! To read The Valentine's Day Curse on Amazon click here or on the book cover. I hope you enjoy it and please consider leaving a review...thanks! "It wasn't the middle of the night phone call that everyone dreads. It was a middle of the day phone call that nobody expects..."I just got a call from a detective. Daddy's dead." And when that crestfallen conversation with my brother came to an end, so did my tranquil way of life. When I rushed out of Roanoke, Virginia and arrived at the family home in Brooklyn, New York, I never imagined the scene I discovered, nor the acts of betrayal I encountered. Written as memoir, and based on a true story, "Fractured Facade" is a cautionary tale for anyone concerned about an elderly parent who has lost their spouse. In an effort to combat their depression and seek comfort, the surviving spouse may find themselves thrust into an unfamiliar dating world, one quite different from the era of their youth, and sometimes one where cunning people create facades to mask their true intentions. Sadly, loneliness can cause an otherwise intelligent person to behave foolishly. So does anger. I hope folks will learn from my mistakes so they don’t make them. "Fractured Facade" is the tale of a father’s death, a daughter’s life, and a sociopath’s vendetta. Please be aware some may find language they deem inappropriate…having lived through this tale, I don’t. Paperback links: Available on Createspace and Amazon. Amazon's Kindle direct link: click here, or on cover. Don't have a Kindle? You don't need one! Click here for Amazon's Free Kindle Reading Apps! Cave Spring Connection - "Local author forges her own way and keeps her own voice"
"Author Inspires Punk Rock Scene at Public Library"
Fractured Facade Book Event - NYC...Live in Roanoke! Click here to see Highlight Video. Click here to read a recap of the event -- Roanoke Rocks! Click here to see full videos of NYC...Live in Roanoke! The author won’t be signing any books, but through vignettes, will share her journey, and the stage. Rather than read a chapter or two from her book, the author endeavors to create a bridge between the tale’s settings of Roanoke, VA and Brooklyn, NY, through the talents of other independent artists. Inspired by a New York City theme, musicians will perform live and visual artists’ exhibit their work. 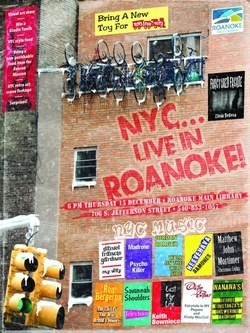 The evening, “NYC...Live in Roanoke!” promises to continue the tradition of Roanoke Public Libraries celebrating our creative community, showcasing talent through unique events that have become synonymous with the downtown library. We're hoping that this event will be the pinnacle of events so far at Roanoke Main Library in terms of cultural creativity. In the spirit of the holiday season, a request is made to bring a new toy to be donated to TOYS FOR TOTS, as well as a non-perishable food item to be donated to the Rescue Mission. Refreshments served - authentic NYC menu of course. who always said, "You're never alone if you're in the company of a good book."